Champagne tastes on a beer budget? Or just a little too much champagne this silly season? While we love our cheap eats, food trucks and food challenges (and have been known to devour a six-patty cheeseburger at lightening speed), we’re a gourmet gang at heart. And there’s nothing better than scoring gourmet food at totally gourmand prices. We’ve discovered some of Brisbane’s best restaurants are also serving up some of the best deals. Join us, won’t you? You’re wallet will definitely thank you later. Seafood lovers will wanna cloister around this pearl of a deal – on Thursdays and Fridays from 4-6pm, Madam Rouge Bar + Bistro serve their slurptastic oysters for only $1. The world’s your oyster! Home to one of the best river views in the city, OTTO is offering a $45 two course set menu and an Aperol Spritz on arrival for lunch or dinner, Monday – Wednesday from now until 27 December. So you can enjoy lunch with colleagues, a weeknight catch-up dinner with friends or power-lunching with clients before the end of the year. OTTO is also offering BYO lunch on Saturdays – you can pair it with a shared three course menu and corkage for $75pp. We’ll raise a glass to that! The guys at Seymours understand that everyone who works nine to five deserves a good wine, which is why Thursday is ‘raid the cellar’ night, where bottles over $100 are half price. De-cant even! You know what’s soy awesome about Sake Restaurant and Bar? They are putting all their most exquisite and gourmet sushi into one express bento box for only $49.00, which means you get left with roe sushi and roe money – win win! They say there’s a stairway to heaven, but why bother climbing stairs when you can reach heaven just as easily through only one bite of Il Verde’s pizza? And thanks to their Slice of Sunday Pizza Special where pizzas are only $20 with any drinks purchase, reaching nirvana just got a whole lot cheaper too! We love to unwind with a bottle of wine, and the Public does too! Which is why they’ve made Tuesday nights BYO wine nights, so that you can be sip happy on a Riesling-able budget. Sound pourfect, no? If the cash you’re pouring into your next function has you sighing in Italian exasperation, then change your ‘Mamma Mia’s’ to ‘Mangia Mangia’ at Popolo. 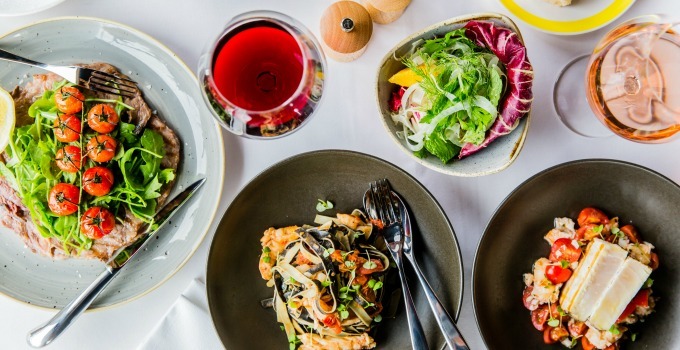 Meaning ‘eat more’, their Mangia Mangia is a six-course shared feast for only $49pp! Which means you get to keep your penne’s and eat them too. Keeping it cost-friendly as well as people-friendly is Kennigo Social House, whose daily two course meals for only $30 package is always changing, leaving guests always coming back for more – not to mention that their delicious meals always make for solid table banter. Socialising has never been so easy! Happy hunting foodies! - the Gourmet looking for ways to avoid her ever shrinking wallet.